Could the Jaguars cut Blake Bortles before Week 1? After a particularly bad preseason performance, could the Jacksonville Jaguars actually cut Blake Bortles before Week 1? 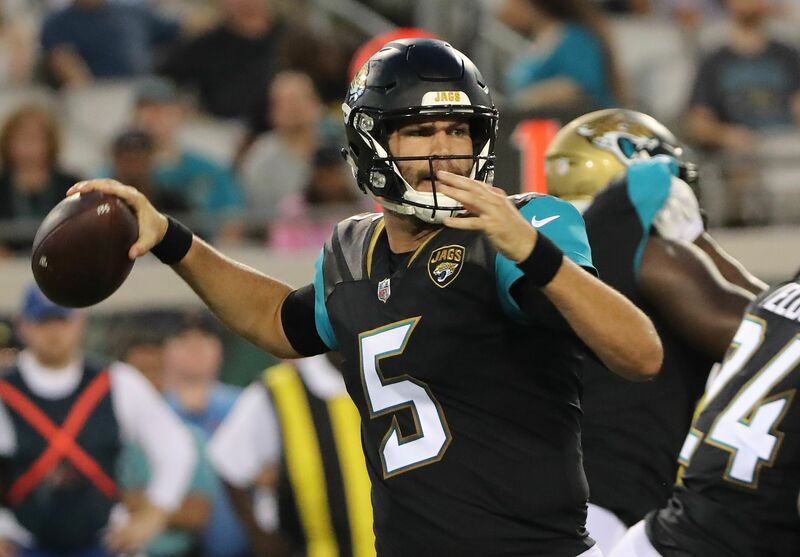 With a track record that included throwing five interceptions in an early camp practice and drawing ire from wide receiver Allen Robinson, Blake Bortles was already on very thin ice heading into this week’s preseason game. But a bad performance against the Tampa Bay Buccaneers Thursday night, on national television no less, led Jaguars’ head coach Doug Marrone to open up the starting job under center to competition. Chad Henne got time with the first-team offense Thursday night, and if not for a couple drops his numbers would have looked better. But he also has not thrown a regular season pass since 2014, and if he was legitimate competition for Bortles he surely would have taken over by now. The Jaguars picked up Bortles’ fifth-year contract option this spring, which puts them on the hook for $19 million in 2018. But that money is fully guaranteed only for injury, and Ryan O’Halloran of the Florida Times Union thinks it would “make perfect sense” for the Jaguars to cut Bortles this summer. If this potentially complicated situation surrounding money guaranteed strictly for injury sounds familiar, it is. The Washington Redskins faced the same situation in 2015 with Robert Griffin III, and they rendered him inactive all season in order to avoid the injury-guaranteed option for 2016. The 49ers and Colin Kaepernick went through something similar a year ago too, but Kaepernick then agreed to waive those financial guarantees so he could play if (and ultimately when) the opportunity came last season. Bortles $3.2 million salary for this year is guaranteed, so the Jaguars would be eating that money if they cut him (barring possible offset language in his contract). But it might be worth it just to open up a roster spot to sign another quarterback, like Kaepernick or even RG3, since it’s finally clear Bortles has no future in Jacksonville.